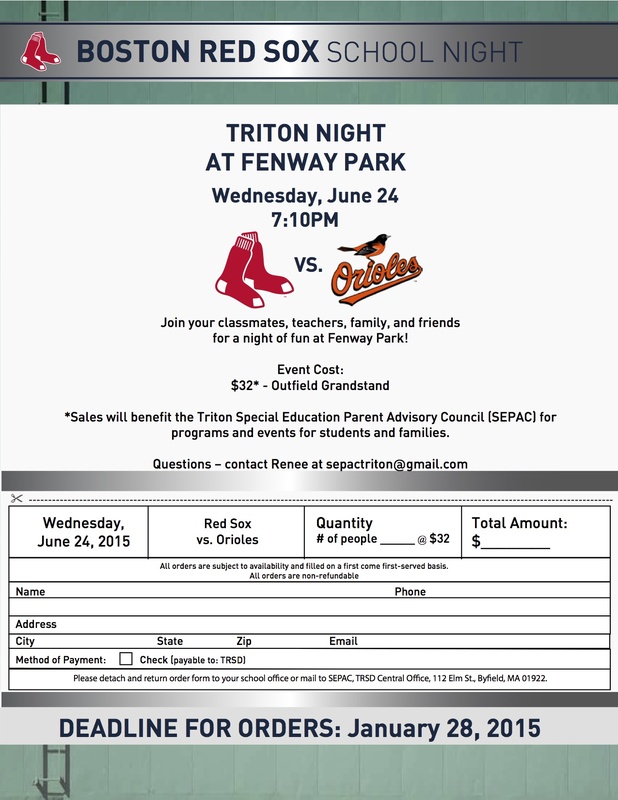 Tickets are on sale now through Jan. 28 for Triton Night at Fenway Park on Wednesday, June 24,for the 7:10 pm game featuring the Boston Red Sox vs. the Baltimore Orioles. Reserved group seating for Newbury, Rowley, and Salisbury fans will be available for $32/seat in the outfield grandstand. This will be a great event to celebrate the end of the school year, giving students, families, teachers, staff, and community members an opportunity to kick off summer in style. All are welcome to join Triton Night! The tickets will be sold based on availability, first-come, first-served, through January 28. Tickets are non-refundable. To order tickets, use the attached order form and return it to a school office labeled “SEPAC” or send a check for your total purchase made out to TRSD to: SEPAC, TRSD Central Office, 112 Elm St., Byfield, MA 01922. Include your name, address, email, phone number, and number of tickets wanted. Seats will be assigned, so if you wish to ensure seating with another group, submit all orders on one form. For each ticket sold, the Triton Special Education Parent Advisory Council (SEPAC) will receive $5 to use for programming and activities for students and families in the school district. The mission of the Triton SEPAC is to work for understanding of, respect for, and support of all children with special needs in the community. ← The NES PTA Annual Fund: Donate now!